The ERTMS-ETCS train control system relies on the GSM-R dedicated radio network for train to ground communications and on terrestrial dedicated network(s) for communications between the control center and the wayside equipments. However GSM-R technology will become obsolete in the next years, has limited capacity to accommodate growing traffic needs and is suffering from interference caused by the LTE. With the introduction of IP technology in the evolution path of the ERTMS-ETCS a number of possible alternatives are being analyzed and, among them we have studied an hybrid telecom system based on public networks (cellular + satellite). Although public cellular services are provided as best-effort, satellite can act as intelligent backup to complement the cellular networks and, all together, provide QoS in line with the ERTMS-ETCS requirements. 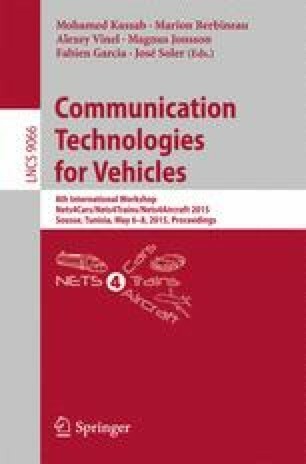 This paper outlines the results of a specific test campaign to assess the performance of the cellular networks and satellite communications in a 300 km railways line for a cumulative 18,000 travelled Km in 21 days. These results, have been processed to estimate the achievable performance in the rail environment and to pave the way for realizing the multi-bearer solution. An economical assessment of the multi-bearer solution is presented making reference to the local and regional lines for which the deployment of a dedicated network is difficult to justify.